Custom Agile-Waterfall Hybrid frameworks support the use of different methodologies in parallel development streams. The capabilities of codeBeamer ALM help you manage the multiple value streams of an Agile-Waterfall Hybrid framework. codeBeamer ALM lets you handle different methodologies contributing to the development of one end product. Standards like (scaled) Agile, Waterfall, V-Model or even custom lifecycle frameworks are easily handled by codeBeamer, with complete data consistency and traceability ensured. Sequential development using the Waterfall / V-model for a high-level control of the product lifecycle is supported, as are Agile approaches for more flexibility and better responsiveness to change. 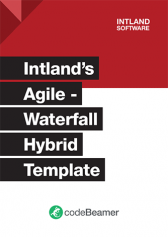 Intland’s Agile-Waterfall Hybrid Template comes out of the box with codeBeamer ALM, and leverages our ALM platform’s features and capabilities to implement parallel lifecycles all brought together in one custom framework. Agile/Scrum and Waterfall/V-model can be combined in complex, n-tier architecture development projects. In most cases, hardware components are developed using a Waterfall/V-model, while software components can be managed with an Agile approach. codeBeamer ALM comes with an Agile-Waterfall Hybrid Template out of the box. To get access to this template, simply start a free 30-day trial of codeBeamer ALM, and use the predefined Agile-Waterfall Hybrid Template when creating a new project. 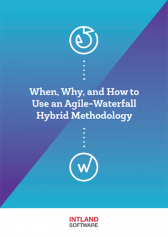 Read our e-book to understand the pros and cons of a Hybrid framework to navigate the compromise between Waterfall and Agile. This template comes with codeBeamer ALM out of the box. To start using it, simply start a 30-day trial for free.